A growing wealth of evidence indicates the pivotal role of Hsp90 in tumourigenesis. Constitutively elevated levels of Hsp90 can be found in a broad spectrum of cancers suggesting a central role in survival and growth of malignant cells 6,7,8. In breast cancer, Hsp90 up-regulation has been found as being linked to the expression of the estrogen receptor and Her-2/Erb-B2 associated with bad prognosis and decreased survival 331. It has been demonstrated previously that expression of HSPs including Hsp90 is up-regulated in breast cancer cells by binding of the tumourigenic factor heregulin-β1 to the heterodimeric cell surface receptor Her-2/Her-3 thereby inducing HSF-1 stabilization which consequently enhanced cell survival and transformation 332. Heregulin activates HSF-1 through PI3K and Akt leading to Hsp90 expression 332. Additionally, Hsp90 stabilizes the conformation of mutant proteins that arise during transformation including v-Src, Bcr-Abl, and p53 333,334 reflecting a multiple effect of these mutants on the cancer cell phenotype. With respect to melanoma, HSP90 expression was significantly higher in tumours than nevi and was associated with disease progression, indicating that it might represent a valuable drug target in melanoma as well as a useful diagnostic marker 335. An increased activity of Hsp90 has also been described in lung cancer expressing a mutated form of the epidermal growth factor receptor which belongs to the group of Hsp90 client proteins 336. Lim et al. reported on a positive correlation between the expressions of Grp94 and Hsp90 and prognostic factors of hepatocellular carcinoma which was found as being associated with vascular invasion and intrahepatic metastasis 337. A similar outcome was obtained in patients with bladder cancer where Hsp90 expression was found to correlate with higher grades such as tumour infiltration 338. A study with 52 epithelial ovarian carcinomas revealed an association of the Hsp90 expression with higher stages, but not with prognosis indicating that it might be a reliable indicator of aggressiveness 339. In head and neck carcinoma, high levels of Grp94 in tumour tissues significantly correlated with advanced cancer stages and poor survival 340. 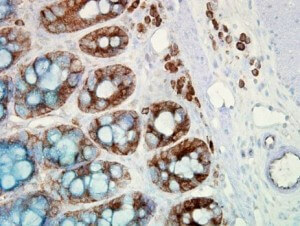 Studies on the predictive role of Hsp90 in prostate cancer are inconsistent. On the one hand, abnormal up-regulated levels of Hsp90 have been observed in human prostatic carcinoma cells with a stage- and malignancy-dependent expression 341,342. On the other hand, no significant association between Hsp90 expression and conventional diagnostic factors could be detected in 193 patients with clinically organ-confined prostate cancer who underwent radical prostatectomy without any neoadjuvant therapies 343. Meanwhile, the plasma level of Hsp90 has been positively correlated with tumour malignancy in clinical cancer patients. As demonstrated by Wang et al., the level of plasma Hsp90α was significantly enhanced in patients with malignant tumours of breast, lung, pancreas, and liver in comparison with normal people, and patients with benign tumours 344. The same study also revealed that, by dividing the tumour patients into metastasis and metastasis-free groups, the levels of plasma Hsp90α in liver or breast tumour patients with metastasis were dramatically up-regulated compared to those of patients without metastasis providing further evidence for the association of extracellular Hsp90α with tumour malignancy, notably metastasis. Despite its impact in carcinogenesis, HSP90s have also been shown to play critical roles in other pathological conditions. For instance, the involvement of HSP90s in various autoimmune diseases, including autoimmune bullous diseases and celiac disease, has been increasingly recognized. In patients with psoriasis, Hsp90α was significantly up-regulated in epidermal keratinocytes and mast cells of lesional skin and could be down-regulated by ustekinumab, a human monoclonal antibody against IL-12 and IL-23 345. An humoral autoimmune response to Hsp90 has been reported in patients with dermatitis herpetiformis (DH), where circulating autoantibodies against Hsp90 were found as being increased at the active disease stage of DH rendering Hsp90 autoantibodies a potential novel biomarker 346. However, further studies are required to support this notion. It is interesting to note that Pires and Khole observed the presence of ovarian autoantibodies to human Hsp90β in sera of women with infertility suggesting a critical contribution of Hsp90β to ovarian autoimmunity as a causative factor in ovarian failure 347. In patients with Guillain-Barré syndrome (GBS), significantly enhanced anti-HSP90 antibodies were found in cerebrospinal fluids from GBS patients as compared with motor neuron disease 348. GBS is a heterogenous group of peripheral-nerve disorders with similar clinical presentation characterized by acute, self-limited, progressive, bilateral and relatively symmetric ascending flaccid paralysis. The study by Yonekura et al. did not reveal any difference in serum antibodies against HSP90 between GBS patients and normal controls 348. Hsp90 is also critically implicated in the pathogenesis of infectious and neurodegenerative disorders such as Parkinson’s disease (PD), Huntington’s disease, Alzheimer’s disease (AD), and frontotemporal dementia 349,350. Hsp90 is used by numerous DNA and RNA viruses to mediate the activity and maturation of various viral proteins (reviewed by Geller et al. 350). For instance, Hsp90 was shown to play a crucial role in the folding and maturation of picornavirus capsid proteins 351. Furthermore, pharmacological inhibition of Hsp90 impaired the replication of poliovirus, rhinovirus, coxsackievirus, and paramyxovirus in cell culture 351,352. Hsp90 has been shown to be a predominant heat shock protein within filamentous inclusions in synucleinopathies, such as Lewy bodies and Lewy neurites, most predominantly within brains from PD patients 353. In this context, Hsp90 interacts with some intrinsically disordered proteins, including the microtubule-associated protein Tau 354,355,356 and α-synuclein highly abundant in the pre-synaptic terminals of brain tissue 353,357. Like Tau, α-synuclein can form oligomeric species that differ in size, shape, and toxicity 357,358. Hsp90 affects α-synuclein aggregation and binding to small unilamellar versicles 359, presumably via binding to the monomeric forms of soluble α-synuclein 360. With respect to tauopathies, Hsp90 not only facilitates microtubule association of Tau, but can also work together with other (co)chaperones, such as CHIP, to facilitate Tau degradation. In this way, Hsp90 is able to promote Tau stabilization and degradation 361. Mutant Tau is particularly susceptible to inhibition of Hsp90, making it a promising lead for therapeutic strategies in AD and other Tau-related disorders 361,362. It is noteworthy that the analysis of reported microarray expression data from AD patients and age-matched controls demonstrated reduced levels of Hsp90 in the diseased hippocampus responsible for Tau accumulation 355. Recent molecular analyses indicate a majority of familial ALS, a progressive and fatal motor neuron disease, is caused by mutations in one of three proteins: the Cu2+/Zn2+ superoxide dismutase Sod-1 or one of two RNA-processing proteins, TAR-DNA-binding protein-43 (TDP-43) or fused-in-sarcoma (FUS) 363. Sod-1-mediated neurodegeneration likely arises from disruption of multiple cellular systems including metabolic signalling and metal homeostasis 364. Mutant Sod-1 is a client of the Hsp70/Hsp90 chaperone network 365, and Hsp90 inhibition with 17-AAG is cytoprotective and decreases mutant Sod-1 levels in primary motor neuron cultures 366. Many recent studies implicate both loss- and gain-of-function toxic effects in TDP-43/FUS pathogenicity. TDP-43 and FUS are binding partners that may act in concert to promote toxicity. ALS-linked TDP-43 mutations increase protein stability and stimulate its association with FUS 367. TDP-43 disease pathology is obviously controlled by the Hsp90 chaperone network, since 17-AAG treatment decreased and re-distributed TDP-43 and diminished the amount of its toxic proteolytic product TDP-25 in a Drosophila model of ALS 368. Analysis of nitrated proteins in the insoluble fractions (TIF) from human spinal cord tissues of patients with sporadic ALS revealed elevated levels of nitrated Hsp90 in the TIF of sporadic ALS patients indicating that nitrative stress may contribute to aggregate formation in ALS 369. Interestingly, the Hsp90 inhibitor geldanamycin was identified to up-regulate the expression of clusterin in motor neurons and astrocytes of murine spinal cord–dorsal root ganglion cultures thus contributing to the neuroprotection previously identified for such compounds in disease models 370. Clusterin, also termed inter alia apolipoprotein J or testosterone-repressed prostate message 2 (TRPM-2), can be found at high level in physiological fluids (seminal fluid, blood plasma, cerebral spinal fluid) and is expressed constitutively at variable levels in a wide variety of tissues 371. Zinkie and collaborators also identified in lumbar spinal cords of overtly symptomatic SOD1G93A transgenic mice, a model for familial ALS, clusterin as a constituent of mutant Sod-1 inclusions, a hallmark of ALS, in common with other proteins associated with protein quality control 370. To which extent clusterin is also implicated in the tumourigenesis of cancer is still a matter of debate, since clusterin expression has been described as being increased or decreased in different cancers including advanced prostate cancer 372 and NSCLC 373. Over-expression of HSPs, including Hsp90 and others have been reported in a preliminary study as being associated with poor prognosis in patients with advanced myelodysplastic syndromes (MDS) in comparison to early MDS and bone marrow 374. MDS represent a heterogenous group of clonal disorders of hematopoietic stem cells characterized by excessive apoptosis which is at least in part responsible for peripheral blood cytopenias 375,376,377. Patients with MDS usually present with one or several peripheral cytopenias despite a normo- or hypercellular bone marrow. MDS are characterized by a high risk of progression to acute myeloid leukaemia which can involve activation of signalling pathways 375,376,377. In a more recent study, the group of Lydia Campos convincingly demonstrated that over-expression of Hsp90 and its client Fak were associated with shorter survival and increased risk of progression into acute leukaemia 378. From these data one can hypothesize that assessment of the level of Hsp90 expression in MDS might be predictive of patient response allowing the selection of patients for which Hsp90 inhibition would represent a most promising therapeutic approach. More limited data are available regarding the expression of Hsp90 in haematological malignancies. Yufu and colleagues found up-regulated expression of Hsp90 protein (Hsp90α + Hsp90β) and HSP90A mRNA in leukemic cell lines and a small series of acute leukaemia patients 379. A similar observation was made in mesenchymal stromal cells (MSCs) from MDS patients where increased levels of Hsp90α/β correlated with a consistent proliferative advantage in MSCs from patients with refractory anaemia with excess blasts and negatively impacted clonogenicity of haematopoietic progenitor cells 380. The group of Lydia Campos reported on the over-expression of Hsp90 in a larger series of patients with acute myeloid leukaemia (AML) correlating with poor prognosis 381. Hsp90 expression also correlated with a concomitant constitutive activation of the ERK and PI3K/Akt pathways in a majority of samples. The role of Hsp90 in preeclampsia (PE), a multisystem disorder with profound implications on both mother and fetus, remains a matter of debate. On the one hand, Hsp90β protein was reported as being significantly decreased in cultured human umbilical vein endothelial cells (HUVECs) from PE compared with that from normal pregnancies 382. On the other hand, several reports revealed a significant increase in Hsp90 expression in HUVECs 383 and in umbilical cord blood red blood cells of preeclamptic subjects compared to normotensive subjects 384. Furthermore, Hsp90 levels in placentas from preeclamptic pregnancies did not differ significantly from those from normotensive controls 262. Prokaryotes express a single Hsp90 ortholog, HtpG. Although not essential for growth, deletion of HtpG results in slower growth at high temperatures 44 and a slight increase in protein aggregation in heat-stressed cells 45. Several results reported by different groups suggest that serum antibodies directed against P. gingivalis HtpG predict health in patients susceptible to periodontal disease and are protective in the untreated periodontal disease patient 385,386,387. Moreover, these studies also found that people with the higher levels of anti-HtpG antibodies responded better to periodontal treatment. This observation might lead to early interventional therapy to prevent early-stage periodontal disease.